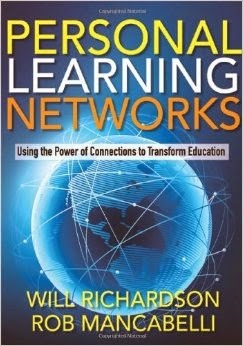 This week I am responding to chapter 4 in Personal Learning Networks: Using the Power of Connections to Transform Education by Will Richardson and Rob Mancabelli. What are the advantages and disadvantages of a Networked Classroom? As I continue to read through this book I think more and more about the endless possibilities you could have with a networked classroom, but I can't help but think all of the work and time you need to put in to get a networked classroom up and running. Some of the advantages of a networked classroom could include overall student engagement. I don't think there is a teacher in the world that could argue that students are more engaged when they are learning about topics they are genuinely interested in. By working in your own personal network students will have the opportunity to access information that our general curriculum may not ever cover. When I think of advantages I also think about the life-long skills students will acquire. Jobs today are becoming more technology driven and it is inevitable that our students will most likely work in a field where they will need to communicate via the internet. By communicating and collaborating with others through a network students will continue to build and develop skills that will stick with them for a life time. Now, when I think about making the change to a networked classroom I have one thought that continually pops into my mind...the TIME! It's going to take a lot of time and planning up front (something teachers usually don't have a lot of). Also, as suggested in chapter 4, you are going to need a team of teachers who are willing to make the change with you. Change can be hard and change can be scary - finding educators who are willing to jump on board right away might be challenging. How can you slowly transition your classroom to a Networked Classroom? I think making the transition to a networked classroom first requires 1:1 devices for students. I think it is important for students to have access to their networks at any time (students shouldn't have to double up on computers or have to "check out" laptops in advance from a grade level cart). In order to achieve this I believe the teacher (and/or school) will need to adopt a Bring Your Own Device policy. With a BYOD policy students are using technology that they are familiar with to access the networks they are familiar with. I'd love to see my students start connecting via our classroom blog, just by commenting in the comments on things I might share. Once we are comfortable with things like this students can start exploring different networking sites, such as Twitter, Youtube, Facebook, etc. There's some really great examples of how teachers are succeeding with their networked classrooms here in this article by SEEN (Southeast Education Network). How can a Networked Classroom meet the needs of diverse learners? Networked classrooms lend themselves perfectly for diverse learners. With a networked classroom students are all working on a common goal, but may be headed down their own, individual, path to get there. A Spanish speaking student may be learning the same content as his English speaking peers but he will be able to connect with people through his network that speak his native language. As I was doing my research on networked classrooms I came across this article from Rice University, where this professor has been using networked classrooms since 1991!! The Networked Classroom by David Lane and Robert Atlas (published in 1996). If this professor could make it work 24 years ago then we can certainly make it work now! One of the disadvantages that I mentioned as well was the time it would take to create a networked classroom. Once you started to implement it, I think it would become a second nature. At first though, creating a networked classroom would be such a huge undertaking on the part of the teacher. The text also mentioned how important it would be to have the parents and administration on board. This seemed like it could also add to the time it takes to transition into a networked classroom. Having others interested in the connected classroom would be very helpful. With that being said, after reading all of the awesome stories of the successful teachers, I was hopeful and encouraged! The transition from a traditional classroom to a networked classroom would be slow, but I think starting off with a classroom blog is a great way to introduce it! I think the transition would be a little faster if each student had their own device. I like your idea of having students BYOD! I do not have access to my own set of laptops/computers for each student, but I do know that many students have their own devices that they would be able to use to connect with one another! It could be a big help in getting everyone connected. The fact we do have to reserve times for devices does make it hard to have technology resources readily available at all times. I like your suggestion of the BYOD to school. Have you seen this policy set into a primary school? I would be nervous for the little ones to carry around something expensive like an IPad. I feel like it would be amazing to have that in place! My districts high school currently rented out IPad minis to every high schooler this year. I wish I could of had that opportunity when I was in high school. So far they have only positive praises with the new policy. I would assume it's a dream for the teachers as well as the students. I did BYOD with my 4th graders and the district I'm in now does BYOD 3rd-5th. It's crazy watching 9 year olds walk around the halls with laptops in their hands, but so far it's been great! It's such an awesome solution for getting enough technology into the classroom. Districts don't have the funds to go 1:1 so why not utilize what the kids already have? When I did BYOD in 4th grade most of my students brought in tablets or iPods. I had clear plastic drawers labeled by tables where students 'stored' their devices. I then had a sign that I flipped that told students when it was an okay time and not an okay time to access their devices. I would LOVE to do BYOD with my 2nd graders and I think that my 2nd graders would love it too. I think it would take a lot of prep work on the parent end of things. Lots of communication so that they can see how beneficial this could be for learning in the classroom. I think timing is everything! You've got to find a time when you're not already starting something new in your building. I also think it would be easier to get people on board if you could prove that it was working and showing success in your own classroom first.